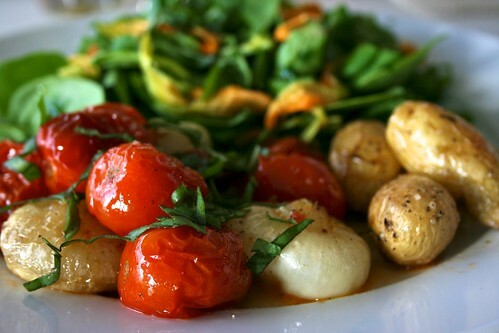 As promised, here is my recent dinner of roasted tomatoes, cipollini onions and potatoes served with the simple squash blossom salad I shared yesterday. Do you see those juices? Who needs a dressing with all the flavor of the roasting juices oozing around the plate? This was an easy meal to whip up. 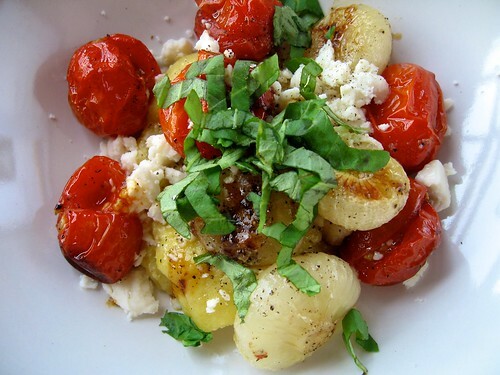 Simply toss tomatoes, onions and potatoes in olive oil. Season with salt and pepper. Roast at 375 for 25-30 minutes. Potatoes will take about 5-10 minutes longer so put those in a separate pan. Once you pull them out, allow to cool a few minutes before plating. 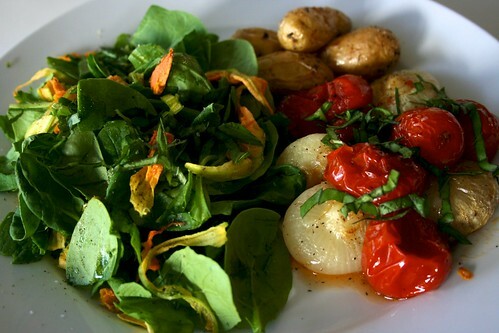 Pile your roasted vegetables on your plate alongside a simple salad like this one. Be sure to pour all the roasting juices over your vegetables. It will add a nice sauce to the plate. When you eat this, be sure to mix everything up with each bite. The flavors all go together so nicely, and this meal will certainly give you your fill of vegetable servings for the day! It’s quite satisfying without being heavy, and it’s oh so tasty! On a side note, I’m pleased to share this whole plate of food was straight from my local farmers market with the exception of the tomatoes and olive oil. However, those were both from a local California source. It feels good to support my community! Are these not absolutely gorgeous? I couldn’t resist picking these up from the Farmers Market recently. 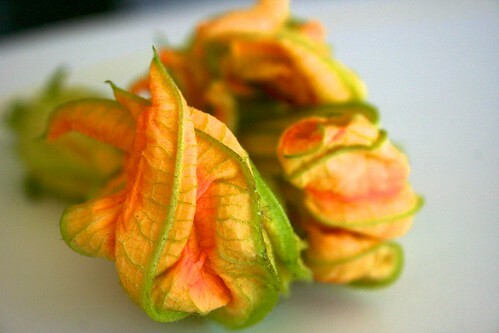 I had never tried squash blossoms, but I’ve been intrigued by them for a while now. While I’d love to try some of the fried recipes I’ve come across online, I try to cook and eat in a (mostly) healthy way 85-90% of the time. That said, I decided to try these in two simple ways. 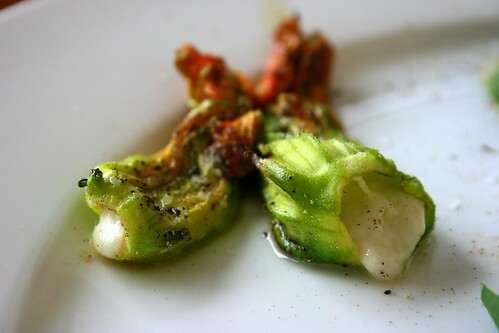 Freshly torn and added into a simple salad, and stuffed with a little fresh mozzarella and quickly sauteed in a bit of olive oil. Both were quite lovely. Last night, I decided to make polenta for the first time. I’ve had this box for a while. It even followed us here from the East Coast! Thought it was about time to use it. I kept it simple. Prepared as the box directed. 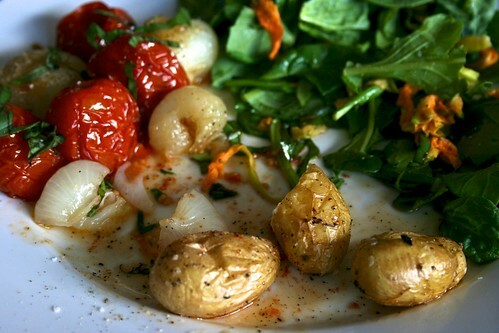 I used it as a base for one of my current favorite things: Roasted Tomatoes & Cipollini Onions! 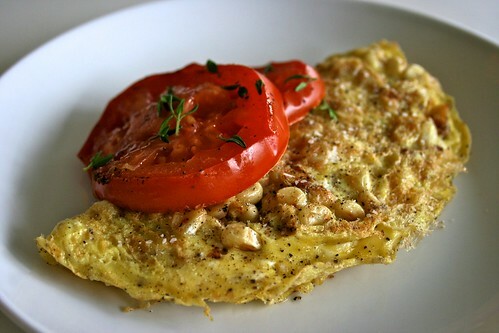 I originally used this recipe from Smitten Kitchen earlier this week without the white beans. It was great, but I wanted to try something different. I swapped the toasted bread for polenta. It was a lovely meal if I do say so myself. Quite satisfying! 1. Preheat oven to 375. 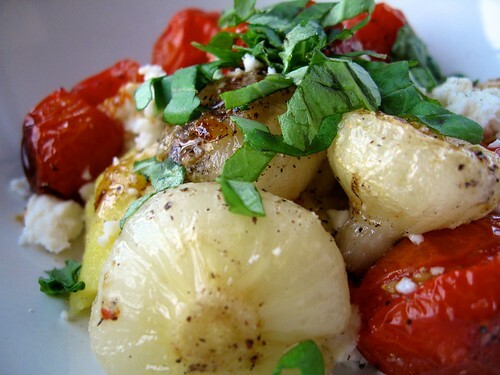 Toss onions and tomatoes in olive oil. Season with kosher salt and pepper. Place in a roasting pan or any oven safe dish. Pie plate would work just as well. 2. Place in preheated oven for 45 minutes. Shake pan and turn onions & tomatoes every 15 minutes. 3. After first 30 minutes of roasting, bring water to a boil. Season with 2 tsp kosher salt. Add polenta slowly while stirring continuously for 5 minutes or until desired texture is reached. 4. 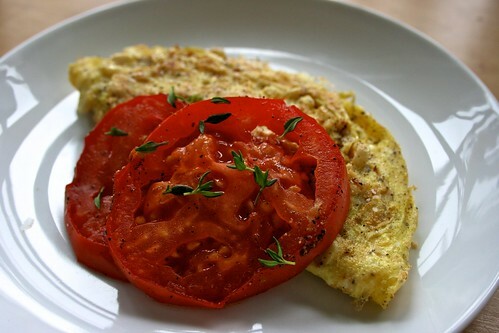 Pull tomatoes and onions from oven. Set aside to cool slightly. Plate 1/2 cup serving of polenta. 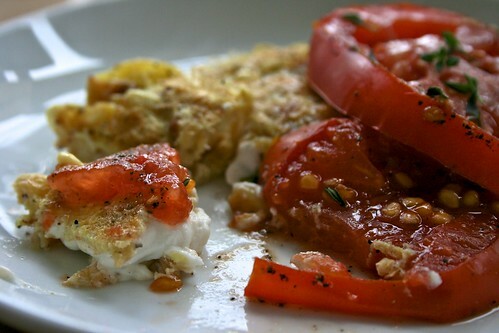 Top with goat feta, roasted onions, tomatoes and juices. Don’t forget the juices! 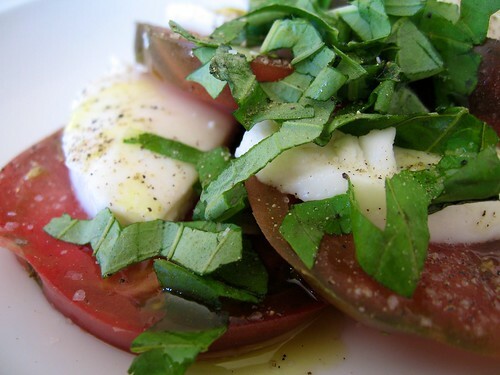 Add freshly chopped basil and enjoy! 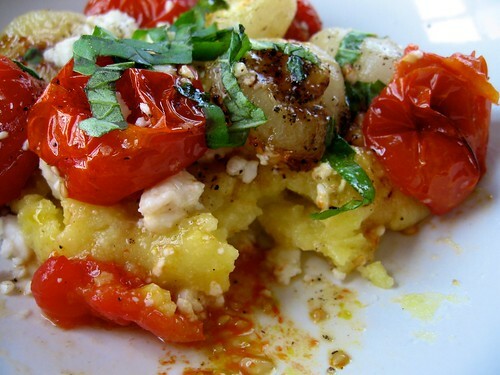 Do you have a favorite polenta recipe? Do share! Pretty please?? Over the weekend, I picked up this amazing Goat Feta at the Little Italy Mercato here in San Diego. Can’t wait to get my hands on more this Saturday! 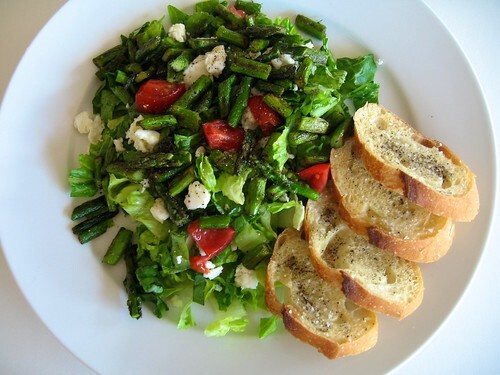 I’ve been eating it mostly in salads like this Asparagus and Goat Feta Summer Salad I threw together last night. I’m a big time salad eater. I know many people think of a salad as totally unsatisfying, but I find the trick is not to use so much lettuce. No, really. Most people (and restaurants) just pile on the lettuce with only a handful of toppings. I find that to be a ridiculous ratio. Generally, I use a cup or two of chopped greens, and then I pile on the good stuff. If all you can taste is lettuce, then what fun is that!? 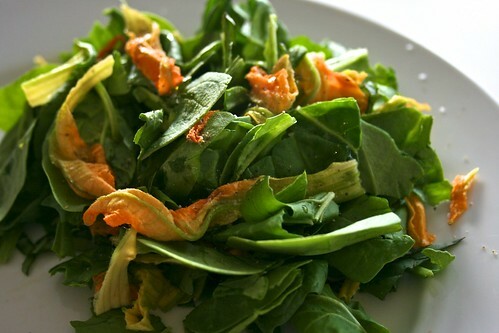 Also, I find by adding the right amount of healthy, tasty toppings to your greens your need for dressing seriously comes into question. Lately, I’ve just added a drizzle of olive oil to my salads. That’s all it needs! 1. Turn broiler on. Place bread slices on a roasting pan. Drizzle with olive oil. Season with salt and pepper. Set aside. 2. Go ahead and plate your lettuce, basil, tomatoes and feta. 2. 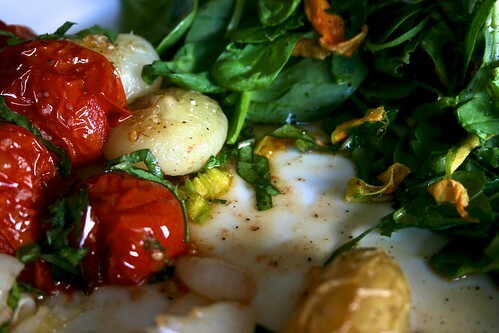 Over medium-high heat, warm olive oil in saute pan. Once hot, add your asparagus. Allow to cook for a few minutes, until tender and slightly blackened. Place bread in oven while asparagus is cooking. KEEP AN EYE ON THE BREAD. You don’t want it to burn. 3. Once asparagus is tender, remove pan from heat. Allow to cool slightly while you remove bruschetta from oven. 4. 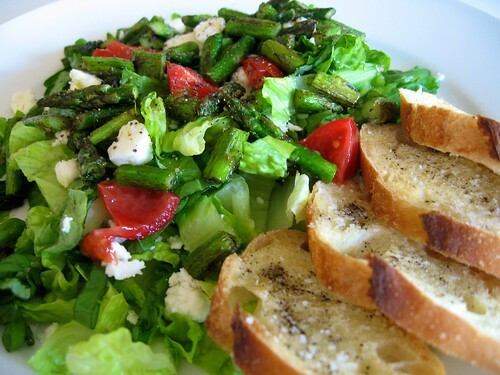 Gently, add cooked asparagus to your salad. Drizzle with the extra virgin olive oil. 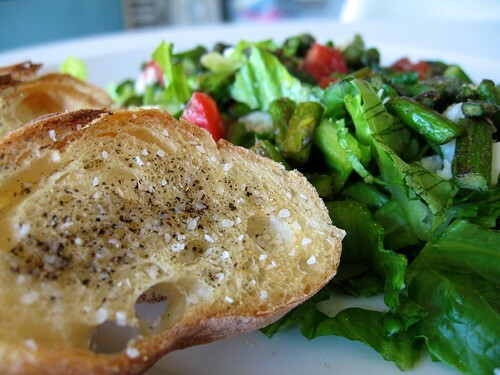 Place your bruschetta alongside your summer salad and enjoy! More on making bruschetta here. Hey Everyone! So much has happened since I posted last. The biggest change was a move from the East Coast to the West Coast! We are based in San Diego now, and summer is in full bloom at the local markets! I’m enjoying many, many heirloom tomatoes at the moment. I just cannot get enough of them. I’ve been adding them to everything. They are perfection. Today’s lunch put these beauties in a starring roll. With quality ingredients, you don’t have to fuss much to make a fabulous meal. 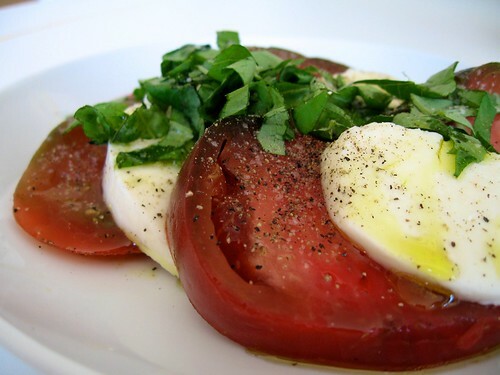 Here I’ve taken a ripe, juicy heirloom tomato, fresh mozzarella, fragrant basil and extra virgin olive oil and combined them to create an absolutely heavenly, light summer lunch. 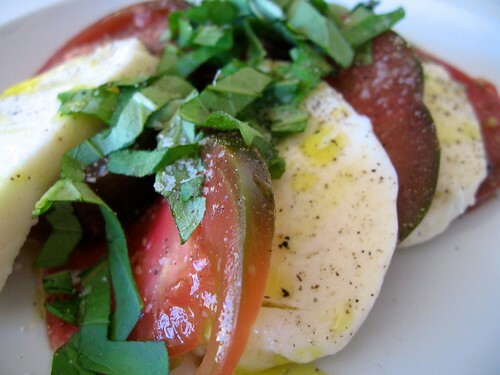 Simply layer the sliced tomatoes and mozzarella attractively. Season with sea salt and pepper. Drizzle with the oil. Top with chopped basil. Serve and enjoy! This would be a lovely addition to a summer dinner party. So much flavor and goodness with little effort!